For those of you who will be in Southern California in October, there's definitely a different way to visit the original Queen Mary in Long Beach during the Halloween season. The 13th Annual Queen Mary Shipwreck Terror Fest is back with a vengeance to scare you shipless as they say. The ship will feature seven mazes populated by more than 400 monsters, mutants and maniacs. Some are in the ship's creepy corridors (in areas not usually open to the public and rumored to be haunted because of unexplained paranormal sightings) and others are deep in the bowels of the ship. The shipwreck is open for 13 selected nights in October. Admission is $35, and that includes not only admission to the mazes, but also a dance party in the Coffin Club and a huge tri-level dance party in the Boiler Room Club. There are also live bands performing outside in the adjacent park shoreside. Complete details are available on the Queen Mary Shipwreck website. Celebrity's new Solstice-class ships won't debut for more than a year yet, and they've promised us truly innovative vessels. But the cruel part is that they are intentionally teasing us. Details of these innovations are dripping out slowly and steadily. For example, earlier this week Celebrity revealed details of the new ships' deluxe ocean view veranda cabins and a special subset of them, Aqua Class, and they have several features other lines haven't thought of yet. The staterooms in these classes on Solstice-class ships will run about 15% larger than the classes on the line's other vessels. The innovation tends to relate to space, the bathrooms being larger, more storage being provided in new ways, and double connecting doors between adjoining staterooms to create a large living space for families traveling together. Details are in today's issue of Cruise News Daily. Paul Allen, HAL's VP of Sales, announced that Page Edmunds has been appointed Director of Consumer Programs. Since 2006, he has led the Central Sales Division. Prior to that he gained experience from his time with Renaissance Cruises and Cruise West. Allen also said that Janet Engel has become Division Sales Director for the Central US & Canada. She was most recently Director of National Accounts for the line. She joined HAL in 1999 as a district sales manager in Minnesota after holding the same position with Carnival Cruise Lines for eight years. At the same time, Gerald Bernhoft is becoming Director of National Accounts. Prior to joining the company in 1985, he was with Princess Cruises. Most recently at HAL he was the Director of Retail Sales of the Windstar brand until it was sold. Ken Muskat has moved from the position of Regional VP of Sales to VP of Sales. In his new position, he will be responsible for for consolidating the brand's distribution strategy and overseeing several teams, including the field sales organization in the US and Canada. He has been with the company since 1995. Magnus Wrahme has been promoted to associate VP of National Accounts and International Sales. He will manage the brand's national accounts and direct the global distribution strategy. Royal Caribbean says he will play a key role in the globalization of the brand. He has been with the company since 1998 and most recently has has been the Regional Director of Sales for Southern Europe. Angela Stephen has been to Director of National accounts and will report to Wrahme. She has been a district sales manager based in Indiana. Juan Silva brings 17 years experience with the company to his new position of Director of E-Distribution Strategy and Development. He will be responsible for developing new electronic booking tools for the line as well as CruisingPower, the line's travel agent website. Most recently he has developed eTools products for travel agents such as VIP CruisePass, e-Connect and the Travel Agent Locator. Right now he is leading the launch of the new version of CruiseMatch, Royal Caribbean's booking engine for travel agents. There is officially a mouse in the house at Meyer Werft at Papenburg (Germany). Disney Cruise Line set up an office at the German yard this week in preparation for the construction of their two new ships. The company is now in the design and development phase of the two ships which will be delivered sometime in 2011 and 2012. The only details which have been released so far are that the ships will be sized at 124,000 tons and have 1,250 staterooms, which will triple the line's capacity. To mark the occasion, Disney presented the yard with one of their official company flags which will fly at the yard's entrance for the next five years while the Disney ships are being delivered. Carnival Corp held their quarterly conference call for financial analysts today, and while there were no major revelations, there were a number of items of interest that relate to issues we've covered. The overall important aspect of the call was that Carnival made money ($1.38 billion in the third quarter), which isn't surprising or unexpected, and they expect to continue to do so. But there were lots of interesting tidbits in the commentary which should be of interest to the consumer, including discussion of a fuel surcharge in the US, if the $50 head tax hurt demand for Alaska, if the US passport requirement has hurt demand, if the expansion in China will continue, and an update on the progress of the pier construction in Cozumel. Before Seabourn Odyssey is launched in mid-2009, the three "Seabourn sisters" are each going to have major refurbishments to make sure they are at the same top standards as the newest ships entering the fleet. Seabourn Pride just completed the process in Germany. Seabourn Spirit will undergo the process in Singapore in January. Completing the fleet's makeover will be Seabourn Legend's drydock at Lisbon in April. Seabourn says the renovations are the most extensive since balconies were added to 36 of each ship's suites five years ago. A popular method of expansion is becoming dedication of a ship for a period of time to a specific geographic/ethnic market source. We've told you about several of these plans recently, but one of the first to employ the strategy several years ago was Carnival's Costa brand. Now the "Italian line" has become the best-selling cruise line in Germany. Today, Costa announced that they have reached the milestone of 100,000 German bookings in 2007. The interior construction process aboard Cunard's Queen Victoria is continuing to move forward at the Fincantieri shipyard in Italy. These photos show the ongoing construction in the Queen's Room. Valencia, CA - September 19, 2007 - Piece by piece, the detail of Cunard Line's Queen Victoria continues to evolve revealing her magnificent public spaces. 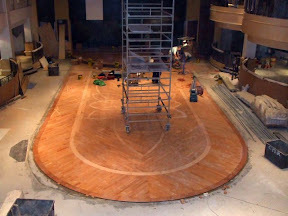 The ship's much-anticipated Queens Room - where guests will dance the night away to the sounds of a live orchestra is seeing a near complete dance floor. It's also the setting for Cunard's signature white-gloved afternoon English tea service. Other hallmark Cunard activities to take place here include formal balls, the traditional Captain's cocktail parties and Cunard World Club events. The dramatic double-height Queens Room, a loggia-style venue, is reminiscent of a grand ballroom in a large country house, with cantilevered balconies overlooking the ballroom paying homage to the line's iconic and much-loved QE2. The room's stunning ceilings feature a pair of gleaming crystal chandeliers as well as specially commissioned murals - by British artists - reinforcing the line's British heritage. Stay tuned for additional previews of Queen Victoria's progress. Queen Victoria will enter service on December 11, 2007. 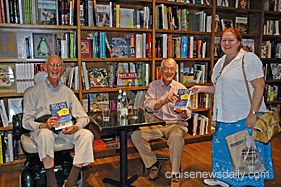 Bob Dickinson and Andy Vladimir recently updated their 11-year-old book, "Selling the Sea: An Inside Look at the Cruise Industry," and Monday night they did a book signing at Books & Books in Coral Gables (FL). They also answered questions from the dozens of people (the same number who watch "30 Rock") who turned out. Bob Dickinson (right) is the retiring former president of Carnival Cruise Lines, and Andy Vladimir is an associate professor emeritus of marketing and management (left) at Florida International University. Here they sign a copy of their book for Pamela Brown of Miami Lakes. Do you remember what you were doing in 1967? If you are one of the Beatles, you were releasing the Sergeant Pepper's Lonely Hearts Club Band album. If you are Queen Elizabeth, you were christening Cunard's new ocean liner, Queen Elizabeth 2. And thanks to the University of Glasgow, you can step back to the late 1960's and see QE2 being built (which is quite different from the way it's done today) in an online exhibit of 70 previously-unpublished photos. You can also see how ultra-modern and "'70's" she looked when she was new (the ship, not Her Majesty). Note: Link is current at time of posting. When QE2 arrives in Liverpool on Friday, it will be getting a very special welcome, according to an article in the Liverpool Post. It will likely be one of the last visits for the liner often called the most famous in the world as it is being retired next year by Cunard. This particular cruise is a special one in honor of its 40th anniversary that sails around Britain. The city of Liverpool is also using this visit to open its new passenger terminal, so that's just reason to make the celebration all the more special. To add even more meaning to the occasion, Liverpool was also the original home of Cunard Line. The celebration includes dignitaries (of course), concerts, fireworks and even a commemorative book being sold. It must be something in the water. Last week and this week cruise lines have unleashed an unusually large number of ways to subtly get their name or ship in front of you through a number of insidious uses of different types of media. 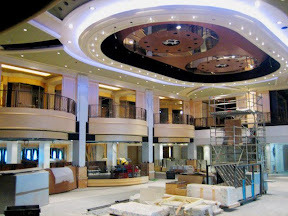 In this CND article we look at four of them including NCL's new "My Space" clone website for it's just-about-to-be-delivered ship, Norwegian Gem, the relaunch of Carnival's Funship Island website for the "un-cruised" (this time for the market it was really intended for), and Royal Caribbean ships twice this week being used as the settings for cable reality TV-shows. While you are there, you can also bowl in the Bliss Ultra Lounge. The port of Wilmington seldom has a cruise ship call, but when does, it's big news. (A few days ago we noted that Empress of the Seas made an emergency call there.) P&O Cruises' Aurora made a call there over the weekend in lieu of New York or Philadelphia, making it the largest cruise ship ever to visit, at about 76,000 tons. So what did the British passengers do? About half the passengers took the opportunity to visit the Liberty Bell and Independence Hall, but according to the local ABC TV affiliate, the other half went to a nearby shopping mall. They probably had heard so much about our mall food. And then there was the one about the doctor from Matfen, England who wanted to see the world, so she went to work for P&O Cruises as a ship's doctor. She did that for two years, but then an opportunity came to work for sister company, Cunard Line, and not only that but aboard the most well-known ship in the world, QE2, during its last year sailing for the line. She jumped at the chance thinking of the fabled world voyages aboard the classic liner. She joined QE2 last Saturday for her first cruise, and where will that take her? Around the British Isles, and her first port call takes her up the River Tyne, just a few miles from home. You can read about Dr. Beth Gregory-Smith in an article in the Hexham Courant.